Great news! Lydia can be bought for pennies this week. 99 of them. If you’ve read Pride & Prejudice, you know Lydia is the youngest of the five Bennet sisters. Like her siblings she has little chance of making a good marriage. Still, Lydia is not your typical heroine. She doesn’t cry over her hopeless future. She sets about to change it, without concern to propriety or decorum. Lydia falls to the charms of Wickham when she’s sixteen, certain a marriage to the handsome fellow is the beginning of her fabulous life. Wickham’s many failings reveal themselves in short order and Lydia realizes she’ll have to secure a better future for them both. So this week you can buy her for 99 cents! As the carriage took off, Wickham frowned with the realization the driver was headed to Gretna Green. His mind sought an explanation as to why they mustn’t go to Scotland. He stared at the bag gripped in her right hand. Damn, what if she bolted? She had his money. He grimaced, hoping to hell she wasn’t going to insist he return the money. He pulled her tight and kissed her. Lydia Bennet was proving to be far more than he'd thought. Not only was she pleasantly responsive to love making, but she also claimed a useful proficiency of lock picking. If that turned out to be true, he might reconsider selling her the moment they reached London. The girl could be useful, especially since she had proven she was no moralist. 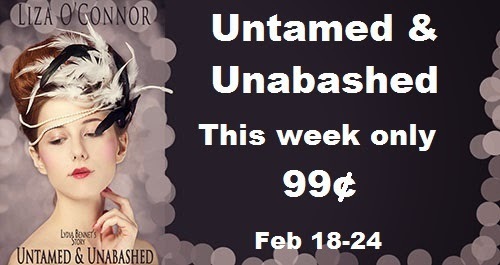 LAST DAY TO BUY UNTAMED & UNABASHED FOR 99 CENTS. 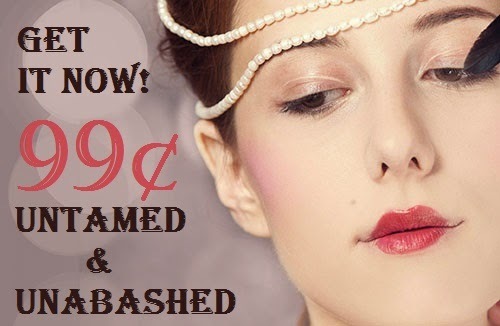 UNTAMED & UNABASHED ONLY 99 CENTS.